Orthodontics is usually our Second Phase of treatment, following the use of functional appliances. The braces would now be placed to move the teeth into alignment to support the development of the bone achieved in the first phase of treatment. 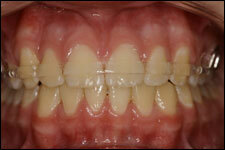 The second phase of treatment is initiated when most of the permanent teeth have erupted. Braces are the small, square metal attachments (called brackets) that are bonded with special orthodontic adhesive to the teeth. There is a small slot in the in the middle of the bracket into which the orthodontic wire fits. 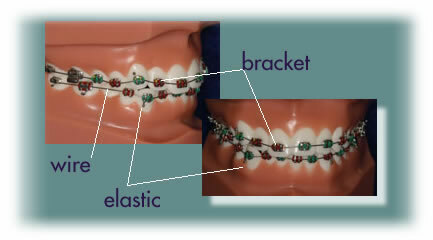 In order to hold the wire in place, small tiny elastics are wrapped around the outside of the braces. It is the combination of the braces, the wire and the elastic that help the tooth move into is proper position. To help make the wearing of braces more fun, patients have a choice of at least 40 different colored elastics. The model below has red and green elastics in keeping with the Christmas spirit. This phase of treatment usually last between 12-24 months depending of the amount of tooth movement necessary to align the teeth and to establish a proper bite. It is important to remember that treatment time is estimated. Our dentist has specific treatment goals in mind and will usually continue treatment until these goals have been achieved. Patient cooperation is the best way to keep on time with your treatment. Be sure to take care of your braces and to wear your rubber bands as instructed and we will both be able to achieve our desired result. 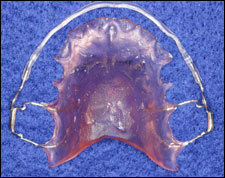 After phase II is completed it is necessary to wear retainers to hold the final result. The great part about our retainers is that they are virtually invisible which helps guarantee patient acceptance and ensures they will be worn at the appropriate times.